Engineering and functionalizing magnetic nanoparticles have been an area of the extensive research and development in the biomedical and nanomedicine fields. Because their biocompatibility and toxicity are well investigated and better understood, magnetic nanoparticles, especially iron oxide nanoparticles, are better suited materials as contrast agents for magnetic resonance imaging (MRI) and for image-directed delivery of therapeutics. Given tunable magnetic properties and various surface chemistries from the coating materials, most applications of engineered magnetic nanoparticles take advantages of their superb MRI contrast enhancing capability as well as surface functionalities. It has been found that MRI contrast enhancement by magnetic nanoparticles is highly dependent on the composition, size and surface properties as well as the degree of aggregation of the nanoparticles. Therefore, understanding the relationships between these intrinsic parameters and the relaxivities that contribute to MRI contrast can lead to establishing essential guidance that may direct the design of engineered magnetic nanoparticles for theranostics applications. On the other hand, new contrast mechanism and imaging strategy can be developed based on the novel properties of engineered magnetic nanoparticles. This review will focus on discussing the recent findings on some chemical and physical properties of engineered magnetic nanoparticles affecting the relaxivities as well as the impact on MRI contrast. Furthermore, MRI methods for imaging magnetic nanoparticles including several newly developed MRI approaches aiming at improving the detection and quantification of the engineered magnetic nanoparticles are described. In recent decades engineered magnetic nanoparticles and related nanoconstructs have attracted extensive research and development in the field of nanomedicine. [1-8] Because their biocompatibility and toxicity are extensively investigated and better understood, magnetic nanoparticles, especially iron oxide nanoparticles (IONPs) composed of maghemite or magnetite nanocrystals, are proper choices for various in vivo biomedical applications. Among them, magnetic resonance imaging (MRI) contrast enhancement for molecular imaging takes advantage of superb and tunable magnetic properties of engineered magnetic nanoparticles, while a range of surface chemistry offered by nanoparticles provides multifunctional capabilities for image-directed drug delivery. In parallel with the fast growing research in nanotechnology and nanomedicine, the continuous advance of MRI technology and the rapid expansion of MRI applications in the clinical environment further promote the research in this area. This review will focus on discussing recent progresses made in understanding intrinsic factors that affect the relaxivity of engineered magnetic nanoparticles as well as the impact on MRI contrast. Furthermore, emerging new MRI techniques specifically developed for utilizations of magnetic nanoparticles as imaging probes and imaging detectable drug delivery carriers are described with a special focus on imaging of magnetic iron oxide nanoparticles (IONPs). Several classes of magnetic iron oxide nanoparticles, also known as superparamagnetic IONPs (SPIO) and ultrasmall SPIO (USPIO) developed in 1980s, has been approved by FDA (e.g., Feridex) for clinical applications with capabilities of traditional “blood pool” agents. [20, 21] The important properties of cell phagocytosis of magnetic nanoparticles has expanded the applications of contrast enhanced MRI beyond the vascular and tissue morphology imaging, enabling many novel applications of magnetic IONPs for MRI diagnosis of liver diseases, cancer metastasis to lymph nodes, and in vivo tracking of implanted cell and grafts with MRI. [21-26] However, the specificities of these dextran coated magnetic nanoparticles in disease diagnosis are limited. The magnitude of contrast effects also need to be improved for high sensitivity to the minimal changes in the disease and for biomarker specific detection. Therefore, the functionalized and engineered magnetic nanoparticles are developed to meet the increasing interests for non-invasive in vivo imaging of molecular and cellular activities that target a disease. To gain the specificity and reduce the side effect and toxicity, biomarker targeted functional proteins or peptide fragments, such as RGD targeting αvβ3 integrin, HER2/neu antibody, urokinase type plasminogen activator (uPA) amino-terminal fragment (ATF), and single chain anti-epidermal growth factor receptor (EGFR) antibody were conjugated on the surface of magnetic nanoparticles, rendering the nanoprobes being recognized and internalized by tumor cells over expressing the specific receptor. [15, 27-30] For example, Yang and co-workers developed a novel cell surface receptor-targeted MRI nanoprobe by using a recombinant peptide ATF of uPA conjugated to magnetic iron oxide (ATF-IO) nanoparticles to target uPA receptor (uPAR). (a) Illustration of Cy5.5-ATF-IO nanoparticles; (b) dual modality imaging (T2-weighted MRI (left two) and NIRF imaging (right)) of subcutaneous 4T1 mouse mammary tumor using Cy5.5-ATF-IO nanoparticles (bottom), no contrast change or optical signal is detected in the mouse that received nontargeted iron oxide nanoparticles (top). Adapted with permission from the reference . ATF-IO nanoparticles can bind specifically to breast cancer cells expressing uPAR followed by cellular internalization through receptor mediated endocytosis. This leads to prolonged and enhanced MRI contrast in subcutaneous and intraperitoneal mammary tumors in T2 weighted MRI (Figure 1) after intravenous administration of ATF-IO nanoparticles into tumor bearing mice. Furthermore, the receptor targeted MRI can be confirmed by optical by near-infrared fluorescence (NIRF) fluorescence imaging in mouse tumor models by co-labeling ATF-IO nanoparticles with the NIRF dye molecule, Cy5.5. This study and the developed uPAR-targeted ATF-IO nanoparticles demonstrated capabilities of functionalized magnetic nanoparticles and showed a potential to improve the specificity of the detection of human cancer by receptor targeted molecular MRI with magnetic nanoparticle probes. More importantly, researchers recognized the importance of the size effect on the relaxivity of the magnetic nanoparticle based MRI contrast. Unlike the earlier studies that used size variable SPIO made mostly with co-precipitation methods in the aqueous medium, ATF-IONPs developed in this study were consisted of size uniformed IONPs (i.e., core size of 10 nm measured by TEM) engineered by using the heat-deposition approach with hydrophobic medium. Because one of the major limitations of MRI is its relative low sensitivity, the strategies of combining MRI with other highly sensitive, but less anatomically informative imaging modalities such as positron emission tomography (PET) and NIRF imaging, are extensively investigated. The complementary strengths from different imaging methods can be realized by using engineered magnetic nanoparticles via surface modifications and functionalizations. In order to combine optical or nuclear with MR for multimodal imaging, optical dyes and radio-isotope labeled tracer molecules are conjugated onto the moiety of magnetic nanoparticles. [31-33] Xie et al. demonstrated the multifunctionalizations of magnetic nanoparticles via dopamine-human serum albumin (HSA) procedure. After exchanging the existing oleic acid/oleic amine, the dopamine modified magnetic nanoparticles can be easily encapsulated in HSA molecules for further functionalizing. In addition to MRI contrast enhancement from the core of the iron oxide nanoparticle, the covalent binding and absorption of 64Cu-DOTA and Cy5.5 provide PET/NIRF imaging capabilities. The application of multimodality MRI/PET/NIRF imaging using this novel probe was demonstrated in the U87MG glioma tumor model bearing mice. Due to the prolonged circulation time, the multifunctional HSA-IO nanoparticles specifically accumulated in the tumor site through passively targeting based on the tumor growth associated enhanced permeability and retention (EPR) effect. Histological examinations and analyses showed that the nanoconstructs were distributed intra-vascularly at the tumor section and not related to the uptake of macrophages. As an expansion from the molecular imaging for MRI based diagnosis, engineered magnetic nanoparticles have been also developed for the MRI-guided delivery of therapeutic agents. For example chemotherapeutic drug noscapine (Nos) was attached on the human ATF (hATF) peptide conjugated IONPs to target uPAR expressed prostate cancer, so that the MRI contrast generated from IONPs can be used to follow Nos-hATF-IO nanoparticles for MRI-directed prostate cancer therapy. The drug carrying uPAR targeting magnetic nanoparticles showed specific binding to uPAR expressing PC-3 cells. While these Nos-hATF-IO nanoparticles with drug molecules embedded in the hydrophobic coating layers of IONPs demonstrated a ~6-fold improvement in drug efficacy, compared to free drug, they also retained the MRI contrast effect from the IONPs cores. Besides small drug molecules, some specific antibodies or small interfering RNA (siRNA) which can inhibit the tumor growth have been also conjugated onto the magnetic nanoparticles for MRI-guided therapies. Hadjipanayis et al. crosslinked EGFRvIII antibodies to IONPs functionalized with carboxyl groups through the EDC/NHS reaction. Significant decrease in glioblastoma cells survival was observed after the treatment by EGFRvIII-IONPs. MRI-guide convection-enhanced delivery of EGFRvIII-IONPs increased the survival of animals bearing glioblastoma xenografts. Since most functionalities assembled by magnetic nanoparticles are accomplished by the surface modifications, the chemical and physical properties of nanoparticle surface as well as surface coating materials have considerable effects on the function and ability of MRI contrast enhancement of the nanoparticle core. The alterations of MRI contrast due to the surface modifications and functionalization as well as novel features of coating materials may play roles in applications of MRI methods in detecting and quantitatively monitor nanodrug bioavailability in the tumor tissues in vivo. The longitudinal and transverse relaxivities, Ri (i=1, 2), defined as the relaxation rate per unit concentration (e.g., millimole per liter) of magnetic ions, reflects the efficiency of contrast enhancement by the magnetic nanoparticles as MRI contrast agents. In general, the relaxivities are determined, but not limited, by three key aspects of the magnetic nanoparticles: (i) chemical composition, (ii) size of the particle or construct and the degree of their aggregation, and (iii) surface properties that can be manipulated by the modification and functionalization. It is also recognized that the shape of the nanoparticles can affect the relaxivities and contrast enhancement. However these shaped particles typically have increased sizes, which may limit their in vivo applications. Nevertheless, these novel magnetic nanomaterials are increasingly attractive and currently under investigation for their applications in MRI and image-directed drug delivery. Where a is a constant, dNP is the diameter of the nanoparticle, D is the diffusion coefficient of water, μ is the magnetic moment of the nanoparticles, γ is the gyromagnetic ratio of the water proton, CNP is the concentration of the nanoparticles, and J(ω,τD) is the spectral density function. As the longitudinal (spin-lattice) relaxation T1 contrast agents affect the relaxation of water proton through direct energy exchange between water and paramagnetic ions, the magnetic moment μ is directly related to the unpaired electrons. While for the T2 contrast agents in form of nanocrystals, the magnetic moment μ is responsible on the unpaired electrons as well as the electron interactions in the crystal structure. The composition of magnetic nanoparticles can significantly affect the contrast enhancing capability of nanoparticles because it dominates the magnetic moment at the atomic level. For instance, the magnetic moments of the iron oxide nanoparticles, mostly used nanoparticulate T2 weighted MRI contrast agents, can be changed by incorporating other metal ions into the iron oxide. Cheon and coworkers have demonstrated that ferrites ((Fe3+)Td(M2+Fe3+)OhO4, M=Mn, Fe, Co, Ni) with different cations doped at the octahedral (Oh) sites exhibit different relaxivities according to their different mass magnetization. The MnFe2O4 nanoparticles have the highest magnetic moment per unit allowing them to exhibit the highest relaxivity at 358 mM-1s-1 at 1.5 T among these ferrites. With Zn2+ dopants in tetrahedral (Td) sites leads to even higher magnetization value, resulting in R2 relaxivity in value of 860 mM-1s-1 at 4.7 T. Other efforts on investigating the compositions of contrast agents were made specifically for shortening the longitudinal T1 relaxation time (e.g. Gd2O3, GdF3, MnO). The selections of these metals are mainly based on Gd3+ or Mn2+ due to their large number of unpaired electrons. This is believed to facilitate the relaxation of protons through the interaction between the magnetic ions on the surface of the particles and the water protons in the media. Comparing to iron oxide, Gd3+ or Mn2+-based nanoparticles have relatively stronger paramagnetic property (large R1, i.e., 1/T1) and negligible magnetic anisotropy (small R2). For example, the R2/R1 value for PEG-Gd2O3 contrast agents is around 1.0 while the R2/R1 value of commercial negative contrast agents, iron oxide nanoparticles such as Feridex, is around 10.0. [14, 38] Besides metal oxides, metal, and metal alloy nanoparticles are tentatively considered as novel particulate contrast agents. This is due to their extreme high saturation magnetism compared with oxides although their stability and potential toxicity in biomedical applications need to be addressed. Metallic Fe nanoparticles prepared by Hacliipanayis et al. have superb magnetism compared to iron oxide nanoparticles. The characterization of the MRI contrast effect suggested that the pure Fe nanoparticles are powerful contrast agents because of the much higher relaxivities (129 mM-1s-1) of pure Fe nanoparticles that were measured at 1.5 T, compared to IONPs with a comparable size. Dai and co-workers have reported metallic alloy nanoparticles for MRI contrast enhancement. They synthesized FeCo/single-graphitic-shell nanocrystals and tested their magnetic properties as MR contrast agents. High relaxivity of FeCo nanoparticles was detected at 1.5 T (R1=70 mM−1s−1, R2=644 mM−1s−1 for 7 nm FeCo nanoparticles), and FeCo has high Ms (215 emu g−1). FePt nanoparticles also exhibit high R2 relaxivity (122.6 mM−1s−1 for 4 nm FePt nanoparticles at 0.5 T) which are superior to T2 contrast agents. The dependence of relaxation rates on the particle size has been widely studied both theoretically and experimentally. Generally the accelerated diphase, often described by the R2* in magnetically inhomogeneous environment induced by magnetic nanoparticles, is predicted into two different regimes. For the relatively small nanoparticles, proton diffusion between particles is much faster than the resonance frequency shift. This resulted in the relative independence of T2 on echo time. The values for R2 and R2*are predicted to be identical. This process is called “motional averaging regime” (MAR) first introduced by Brooks. In this regime, the transverse relaxivity R2 increases with increasing particle size. However for the larger particles, proton diffusion is not the dominant factor for signal decay, as the induced surrounding perturbing field is stronger. Therefore, the relaxation rate 1/T2 becomes independent on diffusion, and will not increase with the increasing particle size. Thus, the value for R2 is usually smaller than R2*. This process is called “static dephasing regime” (SDR) which was first introduced by Yablonskiy and Haacke. Usually the small single core magnetic nanoparticles developed by many research groups and commonly used for MRI applications in vivo are in the MAR. This is where larger magnetic nanoparticles possess a larger magnetization and exhibit higher R2 relaxivity. As described in the Eq. 1, transverse relaxivity R2 is proportional to the magnetic moment. Although magnetism is an intrinsic property of bulk materials, the magnetic properties of nanoparticles are strongly dependent on their size, shape, and surface properties. It has been well demonstrated that the saturation magnetization Ms increases with the particle size. A linear relationship is predicted between Ms1/3 and d-1. [8, 13, 14, 43] Therefore, the capability of MRI signal enhancement by nanoparticles correlates directly with the particle size. For example, Cheon and co-workers systematically studied the relationships among size, magnetism, and relaxivity using size uniformed iron oxide nanoparticles. They found that the transverse relaxivity coefficient (R2) value of the iron oxide nanoparticles gradually increases from 78 mM-1s-1 to 106, 130, and to 218 mM-1s-1 at 1.5 T as the particle size increases from 4 nm to 6, 9, and 12 nm respectively. Many other research groups have also reported on the similar size effect of relaxation rates. [8, 38, 45, 46] However, the R2 relaxivity is predicted to approach a plateau as the particle size continues increasing according to the SDR theory. In the case of polyvinylpyrrolidone (PVP) coated IONPs, R2 values increased from 173.37 mM-1s-1 to 203.86, 239.98, and 248.89 mM-1s-1 at 7 T, when the particle size arise from 8 nm to 23, 37, 65 nm, respectively. However, it has been reported that the size effect became less significant for the single core IONPs above 50 nm. Another approach for enhancing magnetic properties for high MRI contrast effect is to fabricate magnetic nanoclusters comprised of small magnetic nanoparticles, as a result, increasing effective magnetic size. Gao and co-workers developed a type of nanoclusters with polymeric micelles encapsulating 4 nm iron oxide nanoparticles. They demonstrated the dramatic increase of the R2 relaxivity (169 Fe mM-1s-1 increased from 25.1 Fe mM-1s-1 at 1.5 T), thus substantially improving the detection sensitivity (at nanomolar concentration) of targeted tissues. Berret et al. investigated the relaxation behaviors of 6.3 nm IONPs and their nanoclusters. It is found that the R2 relaxivity value is noticeably increased with the size of the magnetic clusters. Compared to 39 mM-1s-1 of bare single IONPs, the transverse relaxivity R2 of the IONPs clusters change from 74 mM-1s-1 to 162 mM-1s-1 at 0.47 T as the cluster size increases from 70 nm to 170 nm. After enwrapped with amphiphilic diblock copolymer PEO-b-PγMPS developed by Chen et al, 13-nm IONPs formed clusters with an averaged core size of 50 nm, resulting much higher magnetization saturation and subsequently higher transverse relaxivity R2 value as shown in Figure 2. The investigation by Weller and co-workers suggested that homogeneously dispersed nanoparticles satisfy the MAR theory while the clusters embedded in lipid micelles is in agreement with the SDR theory with capability of greatly enhancing contrast in T2*-weighted images. For the particulate T1 contrast agents, the paramagnetic ions incorporated on the surface of nanoparticles are responsible for the shortening longitudinal relaxation time T1. As a result, the relaxivity R1 is more dependent on the total surface area of the nanoparticles than on the size of the nanoparticles. Recently, Hyeon and co-workers developed MnO nanoparticles with T1 contrast enhancement and tested in MR imaging of brain, liver, and kidney. They found that the relaxivity R1 decreases with the increasing particle size. The R1 value changes from 0.37 mM-1s-1 to 0.18, 0.13 0.12 mM-1s-1 at 3.0 T, as the particle size increases from 7 nm to 15, 20, 25 nm. To increase surface-to-volume ratio, they etched MnO nanoparticles into hollow structures, where more active Mn2+ are exposed to water. As a result, the hollow MnO nanoparticles exhibited much higher R1 value (1.42 mM-1s-1) compared to the solid ones (0.21 mM-1s-1). With the hollow core-shell configuration, such nanoconstruct could be applied as a drug delivery system with effective MRI contrast enhancement for MRI monitoring drug delivery. 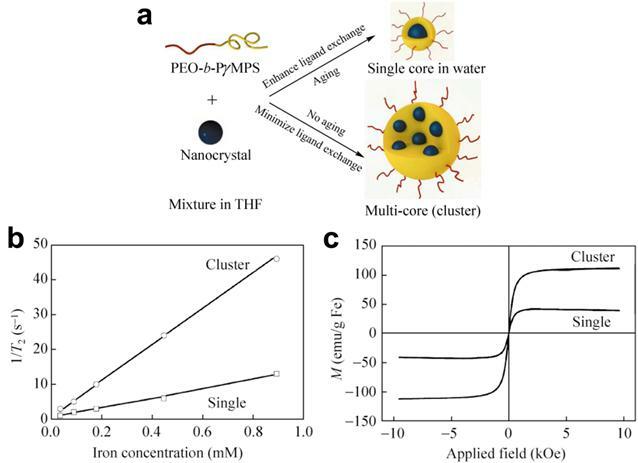 (a) Schematic illustration of the stabilization of nanoparticles with a single core or a multi-core in water using the amphiphilic diblock copolymer PEO-b-PγMPS. (b) Plots of the linear correlations of transverse relaxation rates (1/T2, s-1) of PEO-b-PγMPS-coated monodisperse single core (□) and clustered (○) IONPs against the iron concentration (mmol/L), allowing the transverse relaxivities at 3 Tesla of each nanoparticle formation to be derived from the slopes of the plots. (c) Magnetization of monodisperse single core and clustered IONPs as a function of the applied magnetic field. Adapted with permission from ref . MRI contrast comes from the signal difference between water molecules residing in different environments that are under the effect of magnetic nanoparticles. Because the interactions between water and the magnetic nanoparticles occur primarily on the surface of the nanoparticles, surface properties of magnetic nanoparticles play important roles in their magnetic properties and the efficiency of MRI contrast enhancement. As most biocompatible magnetic nanoparticles developed for in vivo applications need to be stabilized and functionalized with coating materials, the coating moieties can affect the relaxation of water molecules in various forms, such as diffusion, hydration and hydrogen binding. The early investigation carried at by Duan et al suggested that hydrophilic surface coating contributes greatly to the resulted MRI contrast effect. Their study examined the proton relaxivities of iron oxide nanocrystals coated by copolymers with different levels of hydrophilicity including: poly(maleic acid) and octadecene (PMO), poly(ethylene glycol) grated polyethylenimine (PEG-g-PEI), and hyperbranched polyethylenimine (PEI). It was found that proton relaxivities of those IONPs depend on the surface hydrophilicity and coating thickness in addition to the coordination chemistry of inner capping ligands and the particle size. Directly exchange between the multivalent ligands (e.g. PEI and PEG-g-PEI) with the original hydrophobic surface ligand (e.g. oleic acid) facilitates the accessibility of water to the magnetic core. This leads to the rapid exchange and diffusion of water molecules between the bulk phase and the adjacent layer surrounding the particle surface. 10 nm IONPs coated with high hydrophilic PEI polymer showed the highest R2 and the largest signal drop in T2 weighted fast spin-echo imaging as shown in Figure 3. (a-d) Organic polymers for solubilizing hydrophobic iron oxide nanocrystals and schematic structures of polymer-coated iron oxide nanocrystals: (a) oleic acid; (b) copolymer of poly(maleic acid) and octadecene (PMO); (c) poly(ethylene glycol) grated polyethylenimine (PEG-g-PEI), (d) hyperbranched polyethylenimine (PEI). (e) Comparison of traverse relaxation signal intensities (T2) for pure water, Gd-DTPA (a gadolinium complex), and polymer-coated iron oxide nanoparticles as a function of echo delay time. (f) T2-weighted contrasts and color coded R2 maps for iron oxide nanocrystals (10 nm core size) with different polymer coatings. Adapted with permission from ref . This was almost three times higher than that of PMO coated nanoparticles, which have the lowest hydrophilicity. Meanwhile, the capping ligands that strongly bind to surface iron (e.g. oleic acid) largely influence intrinsic surface spin disorders. This partially offset the size effect arisen from the larger surface area to volume ratios. The proton relaxivity of 30 nm IONPs coated with oleic acid and PMO is 2.6 times that of 10 nm particles, while the increase is less than 40% for that capped with PEI. The thickness of surface coating materials also contributed to the relaxivity and contrast effect of the magnetic nanoparticles. Tong et al systematically modified the core size and polyethylene glycol (PEG) coating of SPIOs for the maximal R2 relaxivity per-particle. Using 1, 2-distearoyl-sn-glycero-3-phosphoethanolamine-N-[methoxy (polyethylene glycol)] copolymer (DSPE-mPEG), they were able to control the coating thickness by varying the size of PEG from 500 Da up to 5000 Da. Generally, the measured T2 relaxation time increases as molecular weight of PEG increases, although the effect of the PEG thickness also interplays with the particle core size. At the optimal condition using 1000 Da of PEG coating 14 nm core iron oxide nanoparticles, the R2 relaxivity of PEG coated SPIO reached a value of 385 s−1mM−1 at 7 T, more than 2.5 folds higher than that coated with PEG 5000 Da. The significant thinner coating thickness of PEG 1000 (hydrodynamic size of 28.4 nm for 14 nm core) is considered to be the major factor of the improved relaxivity. Weller and co-workers investigated the relaxivities of MnFe2O4 nanoparticles modified through ligand exchange through additional polymeric coating and lipid micellar embedding. The transverse relaxivity, R2* is greatly higher for the micellar system compared to the polymer-coated particles transferred from same-sized nanoparticles. 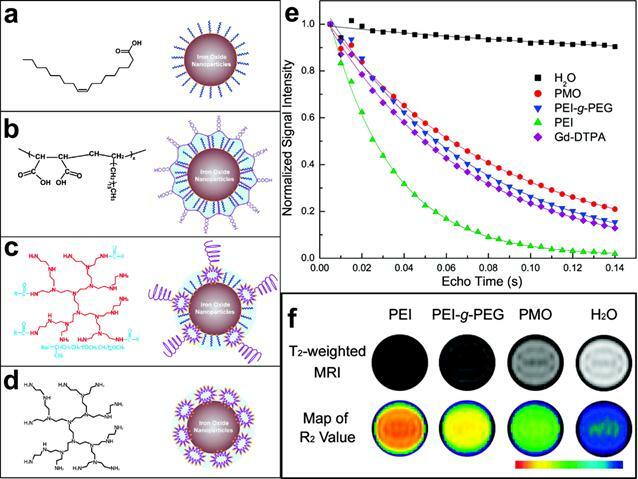 One explanation for the observed high R2 is that the core cluster inside lipid micelles has a larger overall size than the single dispersed polymer-coated nanoparticles. In addition to the discussed composition concern, the surface properties are also important for the responsibility of contrast enhancement. Lipid molecules influence the diffusion of water inside the micelles and in their surroundings. Furthermore, the dephasing proton spins of the lipid molecules also contribute to the signal reduction due to the high viscosity of these molecules. Utilization of contrast agents in MRI leads to hypointense/hyperintense signals in MR images, generating so-called “negative contrast”/“positive contrast”. Because magnetic nanoparticles provide various contrast enhancement options, MRI methods and new imaging sequences can be developed and applied based on different contrast mechanisms to improve the detection of engineered magnetic nanoparticle probes. More importantly probes and drug delivery vehicles can be quantified in vivo using MRI. With a better understanding of MRI contrast mechanisms and properties of contrast materials, the design and preparation of engineered magnetic nanoparticles therefore can be specifically “tailored” to take advantage of the MRI methods for the intended imaging applications. Most engineered magnetic nanoparticles are known as excellent T2 and T2* contrast agents. Magnetic nanoparticles, in a magnetic field, create extremely large microscopic field gradients to diphase nearby protons, and exhibit superb ability in shortening transverse relaxation times T2 and T2*. [10, 58] Therefore, the most commonly used imaging sequences for detecting magnetic nanoparticles are T2 and T2* weighted sequences. [23, 59-62] Spin-echo based T2 weighted imaging provides great anatomic details, and it is insensitive to the susceptibility artifacts because of the property of spin echo readout. On gradient-recalled echo (GRE) images, where T2* effects dominate, an even stronger decrease in signal intensity of target organs is induced. GRE imaging generates more hypointense contrast in T2* weighted images compared to T2 weighted SE images. However, gradient-echo based T2* weighted imaging is more vulnerable to the susceptibility artifacts rising from the tissue-air interface and iron depositions or other local inhomogeneities in some organs and diseased areas, e.g., bone marrow and lung. Imaging sequences used for detecting magnetic nanoparticles are mainly categorized as T2 weighted imaging, T2 relaxometry, and T2* weighted imaging. 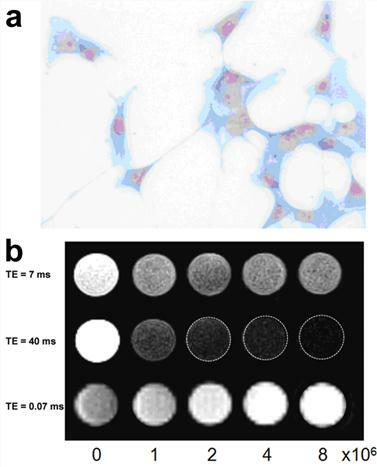 Although both T2 and T2* weighted imaging approach offer high sensitivity for detecting magnetic nanoparticles, the main drawback of the negative contrast is its poor contrast when used to study areas that have low background signals. Another drawback is that they are interfered by high magnetic inhomogeneity or susceptibility effect, which also results in the intrinsic tissue signal void. T2 and T2* weighted imaging methods are also vulnerable to the “blooming” artifacts and partial volume effects making accurate localization and quantitative imaging difficult. [59, 63] Furthermore, higher magnetic susceptibility and stronger T2 and T2* effect from large sized magnetic nanoparticles may not be translated to better negative contrast in T2 and T2* weighted imaging. The contrast may not improve further as the level of signal decrease cannot get beyond voiding the signal from its original level. To overcome these limitations of negative contrast of conventional MRI methods, significant efforts have been made in developing alternative imaging methods that are capable of enhancing the signal or generating bright and positive contrast to improve the detection of magnetic nanoparticles. Alternatively, Zurkiya et al. reported an off-resonance saturation (ORS) method to produce positive contrast. In this method, an RF pulse is designed to be applied at an off-resonance frequency and bulk water protons are imaged with and without the presence of the ORS pulse. This method relies on diffusion saturation transfer to reduce the on-resonance MRI signal. This is similar to chemical exchange saturation transfer. The positive contrast was obtained by taking the ratio or subtraction of the images with and without the saturation. Using this ORS approach, Khemtong et al successfully turned “ON” the tumor-targeted superparamagnetic polymeric micelles (SPPM) in vivo, in contrast to the “negative” contrast from the T2* weighted GRE imaging (Figure 4). Recently Zhou et al. developed a different approach to exploit the positive contrast with a relatively new technique called sweep imaging with Fourier transformation (SWIFT). SWIFT is based on a frequency-swept excitation with virtually simultaneous signal acquisition with the radiofrequency excitation. Therefore it is particularly well suited to image objects with extremely fast transverse relaxation rates such as IONPs. Unlike the off-resonance excitation methods, which generate images that contain signal only in areas that correspond to the locations of IONPs and therefore need an extra image acquisition to provide background anatomic details, SWIFT approach generates IONP-related signal as positive contrast in the imaginary component of the image. The magnitude image contains all the anatomic details of the heart (Figure 5). Owing to the predominant T2 or T2* effects over the usual dipole-dipole relaxation mechanism that affects both T1 and T2, IONPs are usually treated as T2 or T2* contrast agents. On the other hand, IONPs also exhibit a high longitudinal R1 relaxivity providing intrinsic signal enhancement on T1 weighted images. [72, 73] However, conventional imaging sequences cannot fully take advantage of such strong T1 weighted contrast effect because of the predominant T2 and spin dephase effects of IONPs. Ultrashort echo time (UTE) imaging is capable of imaging materials with extremely short T2 and very fast signal decay. With very short echo time, typically below 0.1 ms, UTE imaging allows for signal acquisition with little T2 influence. 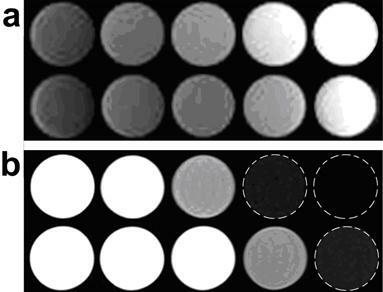 In a recent study by Zhang et al, UTE imaging was applied to generate T1 weighted positive contrast enhancement for IONPs with different core sizes and concentrations in phantoms (Figure 6). The UTE imaging was also demonstrated to yield positive contrast for U87MG human glioblastoma cells targeted with an IONPs conjugated with a small peptide ligand of arginine-glycine-aspartic acid (RGD). This has a high affinity to the cells overexpressing αvβ3 integrin (Figure 7). Ideally, the amount of IONPs should be quantified so that longitudinal studies can be performed for monitoring the delivery of drug delivery, tracking the nanoparticle distributions, and evaluating as well as comparing the treatment responses. Quantitative relaxometry or mapping of relaxivity values over the imaged area is a common and straightforward approach. The relaxometry methods usually use the magnitude information from multi-echo MR images and quantify the concentration of IONPs by fitting the relaxation rate of the IONPs within the tissue. By acquiring data with a multi-echo SE sequence and fitting the signal intensities to the exponential T2 decay equation, Hogemann et al. calculated T2 maps of a limited library of peptide-nanoparticles conjugates for cell uptake on 1920 samples of six 384 well plates (each contains 16×20 wells). This demonstrated that T2 mapping provided exceedingly accurate measurements and receptor binding/internalization data as validated by radioactive assays. 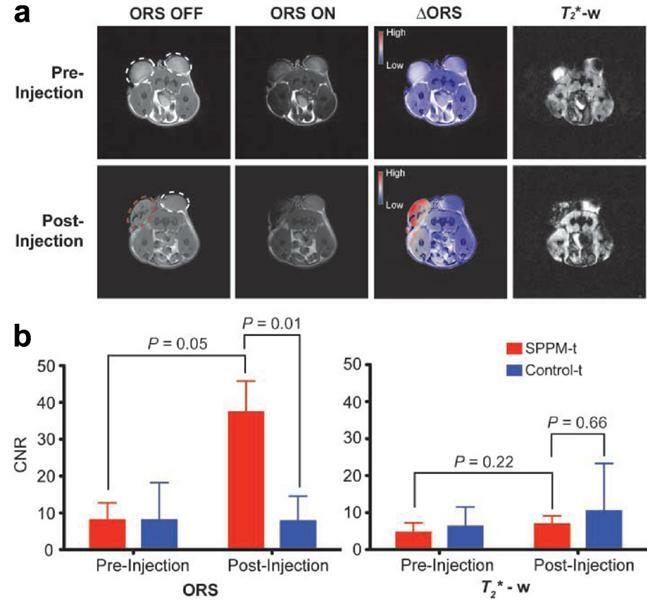 Comparison of ORS and T2* weighted imaging of SPPM nanoprobes (20 μL, 0.25 mg/mL) intratumorally injected inside an A549 tumor xenograft in a mouse. (a) ORS and T2* weighted images of the transverse section of a representative mouse bearing two tumor xenografts (one for SPPM injection (red dashed circle), the other as SPPM-free control) before and after the injection of SPPM. The ∆ORS images were obtained by pixel-by-pixel subtraction of ORS ON images from ORS OFF images and overlaid with ORS OFF images. (b) Statistical comparison of CNRs of SPPM-injected versus SPPM-free tumors by the ORS and T2* weighted methods. Reprinted with permission from ref . 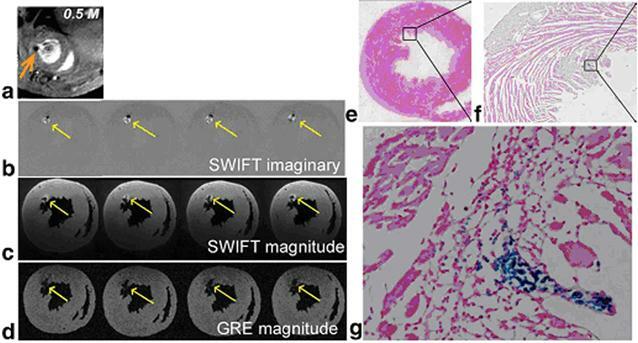 (a) In vivo GRE image; (b) ex vivo SWIFT imaginary and (c) magnitude; (d) ex vivo GRE magnitude images obtained from a heart receiving 0.5 M IONP-labeled stem cells. Arrows indicate location of cells. (e-g) Prussian blue staining of the heart sections at the corresponding level of MR images. Magnified views of the box in (e) and (f) are presented in (f) and (g), respectively. Reprinted with permission from ref . Comparison of T1-weighted UTE and conventional T2-weighted TSE images of IONPs; (a) T1 weighted UTE images of selected IONP samples. (b) Conventional T2 weighted TSE images of the same samples. In each image panel, the top row is the IONP samples with a core size of 25.4 nm and the bottom row is the IONP samples with a core size of 8.7 nm, and the concentrations are corresponding to level 1 (left most) to level 5 (right most). UTE images have lower in plane resolution (1.1 × 1.1 mm2 isotropic) than that of T2 weighted TSE images (0.7 × 0.7 mm2 isotropic). Reprinted with permission from ref . (a) Prussian blue staining confirmed the presence of tumor integrin targeted RGD-IONP conjugates in U87MG human glioblastoma cells. (b) Comparison of moderately T1 weighted TSE images (top), moderately T2 weighted TSE images (middle) and T1 weighted UTE images (bottom) of cell phantoms containing 0, 1, 2, 4 and 8 × 106 U87MG glioblastoma cells bound with RGD-IONP conjugates. Cells were embedded in 2% agarose gel. Reprinted with permission from ref . 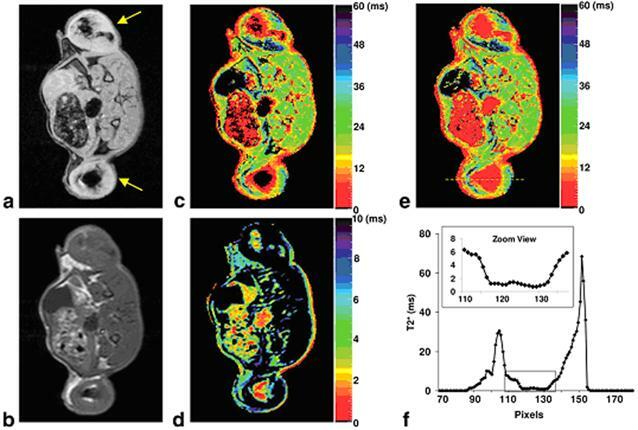 Lee et al visualized small tumors implanted in a mouse with their ultra-sensitive magnetism-engineered iron oxide (MEIO), and he used T2/R2 mapping to evaluate the enhancement and sensitivity of their approach. In a recent study, Liu et al used T2 mapping to show the over expression of ferritin for the demonstration of metalloprotein reporter gene-based noninvasive monitoring of embryonic stem cells in vivo. Because T2 relaxometry methods applied a ”shot-gun” approach to capture T2 decay trend with multiple echo times in one scan. It has better sensitivity than conventional T2 weighted imaging which uses only one echo time that may not be an optimal one for maximal contrast. Since the T2 relaxivity is closely correlated with the concentration of the magnetic nanoparticles given specific physic-chemical properties, the quantification of magnetic nanoparticles can be accomplished. Alternatively, T2* mapping can be obtained using multi-echo GRE sequence. Because T2* has a greater sensitivity compared T2, T2* mapping is expected to be more sensitive than T2 mapping. However, for IONPs with extremely short T2* relaxation times (e.g. ≤ 3 ms), the signal decay may be too rapid for the regular GRE sequence. In a recent study, Liu et al. developed a shifted spin echo (SSE) sequence to allow the acquisition of ultrashort T2* relaxometry. Combined with the regular multi-echo GRE sequence, their approach was able to provide quantification of highly concentrated iron-labeled cells from direct cell transplantation with had extremely short T2* (Figure 8). Model-based methods provide alternative ways to quantify magnetic nanoparticles. With prior knowledge of empirical physics and mathematics models and the MRI data acquired corresponding to the model design, the model-based methods quantify the concentration of IONPs by fitting the experimental MR data in the models. For example, Zurkiya et al proposed a simple model for the ORS method in their original publication which shed the light of quantifying magnetic nanoparticles using the ORS method. In addition, Khemtong et al further reported a theoretical model of ORS contrast and its experimental validation by SPPM with precisely controlled structural properties. A simplified mathematical expression was proposed that allowed for quantitative approximation of ORS contrast for a given SPPM solution with known T1 and T2 values. Very recently, a phase gradient mapping (PGM) method, namely finite perturber method, was proposed by Langley et al. and Zhao et al. This method models magnetic field inhomogeneities by approximating regions containing IONPs as ensembles of magnetic dipoles, and it fits the magnetic field of the model to the experimental magnetic field inhomogeneities identified in the acquired phase maps. This method was verified using data acquired from in vivo mouse models, and it was able to give estimations of the concentration within IONP-labeled tumors that were reasonably close to the known concentration. Another promising approach to quantify magnetic nanoparticles arises from the UTE method. In the study performed by Zhang et al, increases of the signal intensity and positive contrast of IONPs in UTE images were found to be correlated to the increases of the size and iron concentration of IONPs (Figure 9). Specifically, for a certain core size of the magnetic nanoparticle, excellent linear correlation was found between the signal intensity of UTE images and the concentration of the magnetic nanoparticle (Figure 9b). This linear relationship can possibly be used as a simple and straightforward model to quantify magnetic nanoparticles according to the intensity of UTE images after calibration. (a) GRE image of an axial slice of a rat with IONP-labeled flank tumors (yellow arrows); (b) SE image of the same slice; (c) Regular T2* map from the multi-echo GRE sequence; (d) SSE ultrashort T2* map; (e) SSE ultrashort T2* map overlaid on the regular T2* map; (f) Profile of the yellow line in (e). The dark regions within the tumors in (a) and (c) corresponded to highly concentrated IONP-labeled cells. The multi-echo GRE T2* mapping technique failed to detect any signal from the center of the tumors (dark circle) but the SSE ultrashort T2* mapping technique adequately characterized the T2* relaxation times. The zoomed view in (f) clearly illustrated that T2* values in the tumor center were in the range of 0~2 ms. Reprinted with permission from ref . Plots of the signal intensity of T1 weighted UTE images of IONP samples with different core sizes (a) and concentrations (b) show stronger positive contrast with higher iron concentrations and larger core sizes. Pearson correlation coefficients of each plot are indicated in the figure legends. Signal intensity is in arbitrary unit (marked as A.U. in the figures). Reprinted with permission from ref . Much progress has taken place in the theranostic applications of engineered magnetic nanoparticles, especially in MR imaging technologies and nanomaterials development. As the feasibilities of magnetic nanoparticles for molecular imaging and drug delivery have been demonstrated by a great number of studies in the past decade, MRI guiding and monitoring techniques are desired to improve the disease specific diagnosis and efficacy of therapeutics. Continuous effort and development are expected to be focused on further improvement of the sensitivity and quantifications of magnetic nanoparticles in vivo for theranostics in future. The new design and preparation of magnetic nanoparticles need to carefully consider the parameters determining the relaxivities of the nanoconstructs. Sensitive and reliable MRI methods have to be established for the quantitative detection of magnetic nanoparticles. The new generations of magnetic nanoparticles will be made not only based on the new chemistry and biological applications, but also with combined knowledge of contrast mechanisms and MRI technologies and capabilities. As new magnetic nanoparticles are available for theranostic applications, it is anticipated that new contrast mechanism and MR imaging strategies can be developed based on the novel properties of engineered magnetic nanoparticles. IONPs: iron oxide nanoparticles; MRI: magnetic resonance imaging; SE: spin echo; TSE: turbo spin echo; GRE: gradient echo; ORS: off-resonance saturation; UTE: ultrashort echo time; SPIO: superparamagnetic iron oxide nanoparticles; USPIO: ultrasmall superparamagnetic iron oxide nanoparticles; uPA: urokinase type plasminogen activator; EGFR: anti-epidermal growth factor receptor; ATF: amino-terminal fragment of urokinase type plasminogen activator; uPAR: uPA receptor; NIRF: near-infrared fluorescence; PET: positron emission tomography; HAS: human serum albumin; EPR: enhanced permeability and retention; Nos: noscapine; hATF: human ATF; siRNA: small interfering RNA; MAR: motional averaging regime; SDR: static dephasing regime; PVP: polyvinylpyrrolidone; PMO: poly(maleic acid) and octadecene; PEG-g-PEI: poly(ethylene glycol) grated polyethylenimine; PEI: polyethylenimine; PEG: polyethylene glycol; DSPE-mPEG: 1, 2-distearoyl-sn-glycero-3-phosphoethanolamine-N-[methoxy (polyethylene glycol)] copolymer; IRON: inversion-recovery with on-resonant water suppression; FLAPS: fast low-angle positive contrast steady-state free precession imaging; SPPM: superparamagnetic polymeric micelles; SWIFT: sweep imaging with Fourier transformation; RGD: arginine-glycine-aspartic acid; MEIO: magnetism-engineered iron oxide; SSE: shifted spin echo; PGM: phase gradient mapping. This work was supported in part by the following research grants from the National Institute of Health: P50CA128301-03 (HM and LY), U01CA151810-01 (LY and HM) and 1R01CA154846-01A1 (HM and LY).